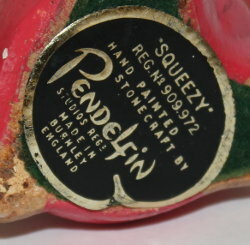 PenDelfin Squeezy rabbit designed by Jean Walmsley Heap. 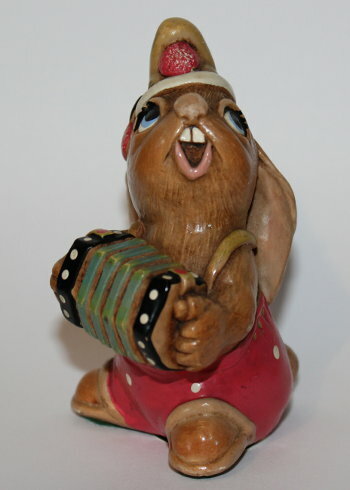 This early and now retired PenDelfin rabbit was produced by the PenDelfin Studios from c1960 until 1970 - he is one of the original members of the PenDelfin rabbit band, perfect for the original PenDelfin Bandstand! This Squeezy is wearing red trousers with matching red pom pom hat. On his base this PenDelfin rabbit has his green felt and PenDelfin artist palette, Squeezy, label. Condition: Overall good condition with a few paint flakes and wear. 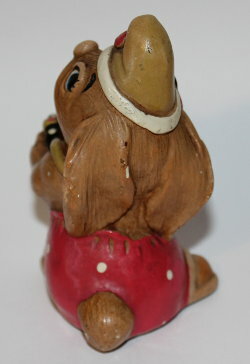 A lovely original member of the PenDelfin band.